This is a well prepared Mexican dish by our Featured Foodie, Jenny with savourthesensesblog.com! Preheat the oven to 375F. Bake the chicken breasts until almost cooked through (about 25 minutes), then shred the chicken. Heat 1 tbsp oil in a large saucepan and sautee the onion until slightly soft (about 3 minutes). Add the can of tomatoes (with juices), lime juice, sour cream, and taco seasoning. Stir well to combine. Bring mixture to a boil, stir in the chicken, spinach and drained white beans, then reduce heat to low and let simmer (about 20 minutes). Place the tortillas between two damp paper towels and steam in the microwave until soft (about 15 second). Fill each tortilla with ⅙ of mixture, wrap and place in a greased casserole dish. 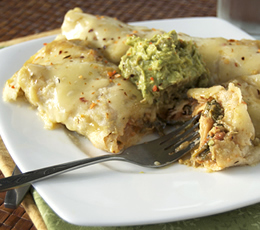 Top enchiladas with verde sauce and pepper jack cheese. Bake covered for 20 minutes. Then remove cover and bake an additional 5 to 10 minutes to finish.